Karrie Sue was introduced to life January 11, 1983, to Lynn and the late Jan (Woodward) Husby at Madigan Army Hospital, Fort Lewis, WA. At the age of two, Karrie and her family transferred to Oklahoma for six years then back to Washington. Her father was serving in the Air Force, and moving around was part of her lifestyle. While in Oklahoma, Karrie was blessed with a baby brother who pestered her to no end. After her father’s retirement in 1995, the family moved to Chewelah. Karrie entered the sixth grade and immediately started making life long friendships. A year later Karrie lost her mother to cancer. This left her dad with two young kids at home and if not for family and a great community of friends things would have been very tough. Karrie was active in school activities and was on the high school cheerleading team for the 2001 boys state championship basketball team. After high school graduation Karrie enlisted in the United States Air Force. 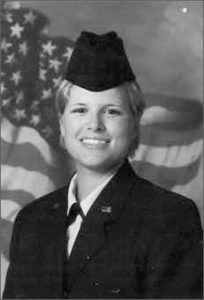 Upon completion of basic training and graduation from technical training school, as an aircrew control specialist, Karrie was assigned to Dyess AFB in Abiline, TX. Karrie helped to manage scheduling and activities for B-1 bomber crews. While she was stationed at Dyess AFB she even coordinated and treated her dad to a two hour B-1 bomber simulator flight. During her time at Dyess AFB, Karrie was deployed for six months to Iraq. The highlight of her time at Dyess AFB was meeting her future husband Chad. He was also stationed at Dyess AFB as a ground equipment specialist. A year later their first daughter (Caitlynn) was born followed by their second daughter (Ashton) two and a half years later. A little over a year after Ashton was born Karrie and her young family received orders to transfer to Elmodorf AFB Alaska. They had a house built and settled into life in Alaska. Karried had separated from the Air Force to focus on raising her family and expanding her craft business. A couple years later Chad separated from the Air Force to also become a private citizen. Karrie was very creative and loved her family and her crafting. She was still knitting stocking caps a couple of days before her passing. Karrie kept her sense of humor with her right up to the end. Karrie was preceded in death by her mother Jan (Woodward) Husby, grandparents Keith and Sue Woodward, of Goldendate, WA, grandfather Stan Husby of Chewelah, aunt Leona Husby, Arlington. She is survived by her husband Chad, daughters Caitlynn (12) and Ashton (9). Father Lynn and stepmother Deborah Husby of Chewelah, brother and sister-in-law Cory (Keyla) Husby, Jopkin, MO, grandmother Donna Husby, Chewelah and step-grandfather Robert Flugel of Chewelah and many aunts, uncles, nephews and cousins. Per Karries request no memorial services are planned but a celebratio of life will take place in the future. In lieu of flowers or gifts, if you would like to make a donation to Karries young family you may mail them to Chad and their children, C/O Lynn Husby, PO Box 323, Chewelah, WA, 99109. Karrie considered Chewelah her first real home and loved her many friends.